Info about Bigelow Mountain in Maine, named after Timothy can be found on Page 2. Complete text of Howe's entry for Timothy can be found on Page 3. 16953 Andrew, b 30 Mar 1769; d. _ Nov 1787. 16954 Rufus, b 07 July 1772; d 21 December 1813 Baltimore, MD; unm. He was a prominent merchant in that city. 16956 Clarissa, b 29 Dec 1781; d _____ ; m 26 Nov 1806 Tyler Bigelow. ; res. Watertown; 8 children. Timothy Bigelow was early apprenticed to the blacksmith trade, and carried on that occupation most of his life. He was self-educated, and as a young man was widely-read and became a fluent speaker, and accumulated a little library. He was known locally for his prowess at debating. He early espoused the anti-British sentiment, both writing & speaking a break with the mother country. At the opening of the conflict between the colonies and England, in Mar 1773, Timothy was a member of the Committee of Correspondence. In December following he organized the "Political Society," the meetings of which were held in his home, and by means of which the power of the Tory party was broken in Worcester. In 1774 the citizens formed the Sons of Liberty through the influence and support of Bigelow. He was a member of Boston's Whig Club, and associated with Warren and Otis, and other leading colonial advocates. He was a delegate to the Provincial Congress in its first two sessions. In the formation of the Minute Men in Worcester, Timothy Bigelow was chosen its commander unanimously, and he drilled the men so thoroughly that when Gen. George Washington reviewed the company, he said, "This is discipline, indeed." Bigelow marched at the Battle of Concord and Lexington, and soon after was commissioned a major. In September following he volunteered for the expedition to Quebec under Benedict Arnold going by way of the Kennebec river through the wilderness of Maine. On this expedition Maj. Bigelow was ordered by Gen. Arnold to ascend a mountain near the headwaters of the Kennebec, with a small party of men, for the purpose of reconnaissance. This mountain today bears the name Mt. Bigelow. just in time to allow us to get out of the way." Bigelow proceeded on the march to Quebec, and on the 31st of December was taken prisoner by the British, and kept prisoner until the following August. He, with other prisoners, was taken to New York, and then exchanged. He promptly reentered the service as Lieut-Colonel under General Gates, and in 1777 was commissioned a full Colonel, the highest rank of any Bigelow during the Revolutionary War. He was at Saratoga, Verplanck's Point, Peekskill, Valley Forge, West Point, Rhode Island, New Jersey, and the surrender of Burgoyne. After the War he came home ill and was unable to resume his occupation as a Blacksmith. It was then he went to West Point for some time, and was appointed commander of the arsenal at Springfield. When his health broke he returned to Worcester, after eight years in the army and found his property and business seriously diminished and encumbered in debt. With others he obtained a grant for 23,040 acres (dated 21 October 1780), on which was founded the town of Montpelier, VT. He never saw the grant. His Son Andrew's death from consumption in 1787, and the pressure to pay off his indebtedness caused his health to decline. With his finances depleted. He resumed his occupation of blacksmith, but with the post-war inflation, his own distaste for business, and the pressure of friends who had lent him money, he was thrown into debtors' prison. He died in debtors' prison 31 Mar 1790 at the age of 51. A friend, Isaac Thomas, placed a single line in the Massachusetts Spy announcing his obituary. His widow Anna died 09 July 1809 at Groton, MA. It is said that he was of fine personal appearance, over six feet in height, with military bearing. In addition to his vigorous mind, he had a warm and generous heart, according to Howe's Bigelow genealogy. Montpelier Vermont was founded and named by him. Bigelow Mountain in Maine, the same that he climbed, is named for Timothy; its possession is now disputed by both Whites and Indians. see - article about the Monument at the foot of Bigelow Mountain in Maine. Worcester Common has a Bigelow monument, Presented by Grandson, Timothy Lawrence, in 1861. Bigelow, Timothy, Worcester. Captain, Col. Artemas Ward's regt., which marched on the alarm of April 19, 1775; service, 5 days; reported enlisted into the army; also, Major; list of officers of the main guard taken May 8, 1775; also, list of officers of the main guard, dated Cambridge, May 11, 1775; also, lists of officers of the picket guard, dated Cambridge, May 15, May 21 and May 22, 1775; also, list of officers on fatigue duty, dated Cambridge, May 25, 1775; also, 2d Major, Gen, Ward's regt. ; commissioned May 25, 1775; also, Col. Jonathan Ward's regt. ; muster roll made up to Aug. 1, 1775, dated Dorchester; enlisted April 19,1775; service, 3 mos. 20 days; also, company return dated Dorchester, Oct. 7, 1775, reported on command to Quebec; also, Col. Ward's regt. 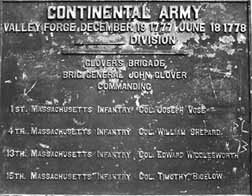 ; Maj. Gen. Thomas's division; list of field officers of the Continental Army in 1776; also, Col. Artemus Ward's (Worcester Co.) regt. ; list of field officers [year not given]; also, Colonel, 15th Mass. regt. ; Continental Army pay accounts for service from Jan. 1 1777, to Dec. 31, 1779; also, muster roll for Jan. - Sept., 1777, dated Van Schaick's Island; appointed Jan. 1, 1777; reported on command at Worcester; also, pay abstracts for Nov. and December., 1778, dated Providence; also, muster roll for March and April, 1779, dated Providence; reported on furlough; also, muster roll for Aug, 1779, dated Lower Salem; reported sick at Ridgefield; also, list of settlements of rank of Continental officers made at West Point by a board held for the purpose and confirmed by Congress, Sept. 6, 1779; commissioned Feb 8, 1777; also, Continental Army pay accounts for service from Jan. 1, 1780, to Dec. 31, 1780; also, muster roll for Jan.- June, 1780, dated Robinson's Farms; also, muster roll for November and December., 1780, dated Garrison at West Point; reported absent at Fishkill; also, pay abstract for October.-December., 1780, dated Boston; reported deranged Jan. 1, 1781. Bigelow Society,The Bigelow Family Genealogy Vol I, pg 73-74. Forge Volume 10, No. 3, page 8-9. The following epitaph, copied from a marble slab in the Lawrence Lot of the Cemetery at Groton was furnished by Dr. Samuel A. Green. It is a supplement to the "Inscriptions from the Old Burial Grounds in Worcester, Massachusetts," recently published by the Worcester Society of Antiquity. Tombstone, Marble Slab, Lawrence Lot, Groton, Mass. "Here lie the mortal remains of Mrs. Anna Bigelow, Relict of Colonel Timothy Bigelow of Worcester, Mass. She died August 2, 1809 AEt 63 Years." The New England Historical & Genealogical Register [XXXIV. 99]. January 1880. I enjoyed, particularly, your histories of Col. Timothy 4 Bigelow and Timothy C. Bigelow, for separate reasons. another Percheron, "Normandy(ie)." If this is a definite match, your information will prove invaluable to me in writing up our family history. After all, "Louis Napoleon" has become almost like a member of the family after all these years! Thank you for your in-depth family history. It was great reading! An ancestor of mine, Asa Harrington, fought in Timothy Bigelow's regiment. I am trying to recreate Asa's 8-year enlistment in the continental army through his pension records as well as diaries kept by other soldiers and books on the various battles he was in. Asa served under Bigelow up until the time Timothy was "reported deranged" on 1 Jan 1781. Thereafter Asa served under other commands, until he was discharged by General Washington himself, in 9 June 1783.
other information that might be valuable? I would very much appreciate any source information (other than the one's listed under your biography of Col. Timothy Bigelow, of course -- however what was the Forge Volume??? Does it have a title, an author?) I await your reply-- thank you. Hi! I wandered onto your website as I have recently found a possible (strictly secondary data) connection with my Harrington's and your Bigelow's (Abigail Bigelow, daughter of John Bigelow (1617-1703, England to Watertown, MA). Abigail supposedly married Benjamin Harrington (whose father Robert (1616-1707 England to Watertown, MA might have been my 8th grandfather). Anyway, I have a revolutionary Asa Harrington, who is my 5th grandfather and served under a Capt. Timothy Bigelow's co. of Minute-men, 1st MA regiment, Col. Artemas Ward's regt., which marched on the alarm of the Battle of Lexington, fought at Bunkerhill, marched to Quebec with Col. Benedict, fought at Saratoga, endured Valley Forge and fought at the Battle of Monmouth Courthouse. On 1 Jan 1781, Col. Timothy Bigelow is reported as "deranged" (probably battle fatigue?) Asa transferred to another company after that so I don't know much else about Timothy except that according to the History of Worcester, MA, he died a very poor man, I believe not too many years after the war. I was curious to not see this person on your website. You do have one Timothy who was a Rev. Soldier but from your records, not the same one. According to the Worcester history Timothy was very involved in local politics, high-up, and then an extremely accomplished soldier and commander of men. Unfortunately, the war apparently took everything out of him, as it did so many. My Asa actually lived quite a long life after the war, but he too died a very poor man. Yesterday, while researching I found a letter that Coln Timothy Bigelow wrote to Major General Heath, Boston, N. England, regarding needing more soldier uniforms while at Valley Forge. Here is a transcription: "Camp Valley Forge, 7th April 1778 Sir, I have by his Excellency's direction sent Major Bradish as far as Boston for the purpose of procuring clothing for my regiment. I shall rely on your goodness to assist him in the Undertaking should he stand in need of your inter[jection?] Nothing worthy of notice has taken place in this quarter of late -- Every circumstance concurs to lead the general to suppose the campaign will [open?] early. As much will depend upong the exertions of N. England, recruits from thence ought to be [pushed?] on with all possible expedition. With the highest esteem I am Sir, your most ? ? [looks like it could be sterm Lord? but can't be, probably more like, humble servant] Timo[thy] Bigelow. These are interesting tidbits for your files, should you you ever find a Bigelow connection to Coln. Timothy. Since then I have found muster rolls, etc. that place not only Asa Harrington but Timothy Bigelow at Valley Forge. I was surprised that you didn't talk more about his civic involvement before the war. I understood from that "History of Worcester" by William Lincoln and the "Worcester Society of Antiquity" v25 p195-218, that he was pretty big in politics before the war.Cheers! I didn't see reference to Bigelow Mountain Range/Bigelow Mountain in Maine. The range was named after Colonel Timothy Bigelow, who was Great grandson to John Bigelow and Mary Warren. Col. Bigelow was a scout for Benedict Arnold. You have done a great job on the site. I'm in the process now of writing a grant to publish a 4-color pamphlet to promote fundraising for the monument. I will keep you informed if we hear from members of the Bigelow Society. I was very interested in reading the history of the Bigelows as I was researching my relative, Jonathan Emery, who housed Benedict Arnold in Fairfield in 1775. Jonathan Emery was a great, great, great grandfather of my grandmother, Mary Emery LaPointe, (born in 1865) My mother, Rose Alma LaPointe Beaulieu, had very good records of the Emery family going back to John Emery, son of John and Agnes Emery of Romasey, Hampshire Hauts, England in 1598.
maternal (Emery) side, Jonathan Emery. Jonathan Emery married Jerusha Barron in 1722. 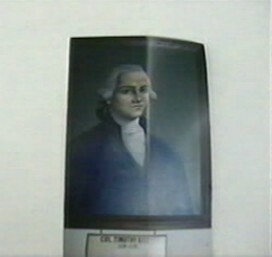 His wife died in Fairfield in 1781 and he then married a widow by the name of Whitten. I was brought up in Fairfield and still live in the area. It was very interesting to hear my mother talk about her relative, Jonathan Emery. The hill near his home is named Emery Hill (after him)and the Arnold Trail is very well marked for all tourists who are interested in history.